Kryston Jackal, Mantis, Quicksilver, Snake-Bite, Snake-Skin, Osprey & Sufix. Coated with a removable anti-tangle skin and an extra supple braid inner that perfectly blends in with all possible lake beds. Produced entirely from high grade Spectra the worlds strongest filament Jackal has handled specimen size fish both at home and abroad with ease. This remarkable low diameter hooklength is tough enough to cope with all the demands that modern day specialist angling can throw at it. 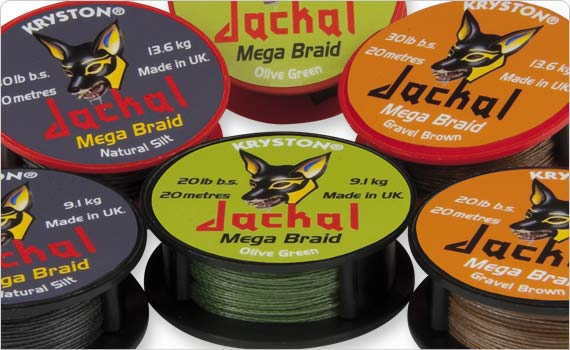 Jackal?s unique multi-coating and curing process ensures it is totally fish friendly unlike many low diameter braids on sale. Its extreme low diameter allows superfine presentation and due to its super tough coating the abrasion resistance is exceptional for such a low diameter line. 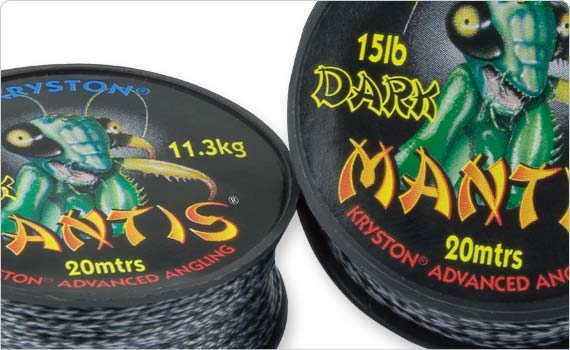 The finish of Mantis Dark deliberately mimics a dark Silkworm and is purposely designed to present bait over silt and mud. Ultra tough abrasion resistant snag / shock leader material. 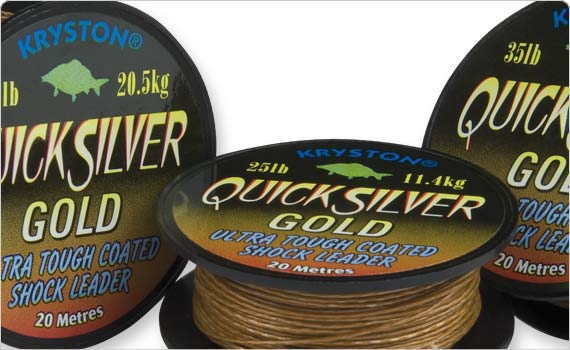 When fish drag line over underwater hazards Quicksilver's dense construction helps prevent premature line failure. The coating has a threefold effect. and once removed allows the ultra fine braid to offer complete freedom of movement to the hook-bait. Golden brown internal core making it the perfect tool for presenting bait over gravel, clay, sand, and brown silty bottoms. Stiff slow sinking polymer coated hooklink. 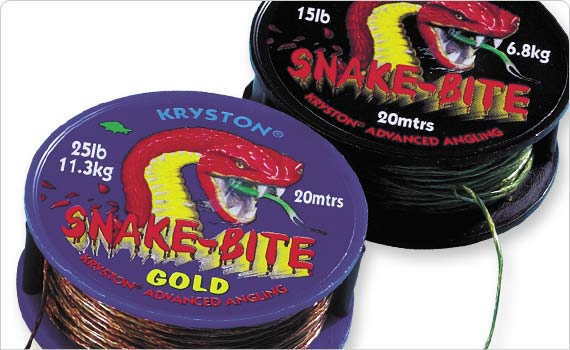 Snake-Bite offers superb presentation of bait whilst coating ensures tangle-free cast. Using a complex braiding technique the world?s toughest fibre is meticulously woven to exacting surgical standards. This produces a superb high strength braided inner core that is incredibly abrasion resistant. To give the braid even more protection it then undergoes a further process by adding a hi-tech polymer coating to it. In order make the coating super tough it has to be slowly built up in layers, rather like a varnish. Twenty-four separate layers later the coating is complete. Super Hybrid Multi-Link THE WORLDS FIRST ANTI-TANGLE HOOK-LENGTH. An inner core of Kryston Multi Strand the most undetectable line in the world has been encapsulated with a unique removable anti-tangle coating. Once a section of coating near the hook has been removed the ultra soft core is exposed allowing totally unfettered presentation of bait. 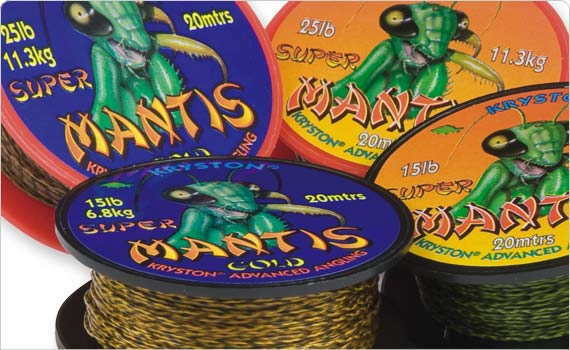 As the bait is mouthed the multi-stranded fibres automatically flatten on touch. The quick sinking fluorocarbon coating compliments the Chameleon range perfectly, optimising camouflage and disguise, the low visibility inner blends perfectly in all water colours. A super fast sinking hook link. This multi-link offers exceptional camouflage properties and produces a wide range of advanced rig presentations. Made with heavy fluoropolymer and super strong Dyneema fibers which are encapsulated with a stiffer, tangle-free removable outer skin. 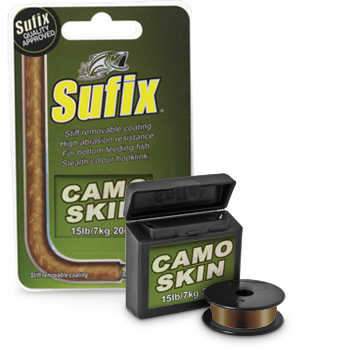 So supple that running your fingers over Camo Skin will allow it to straighten. 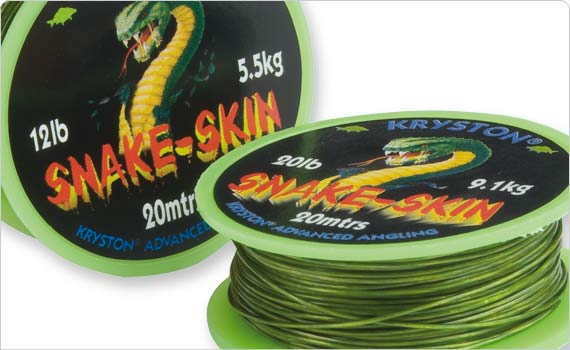 This super strong, fine diameter braid is made with a stripable outer skin and stealth properties. Whether you keep the "skin" on or strip it, the same stealth line color will keep this hook link well hidden. A neutral buoyancy Dyneema braid is encapsulated with a tangle-free removable outer skin. So supple that running your fingers over Sheath Skin will allow it to straighten. High knot strength and unrivaled abrasion resistance. 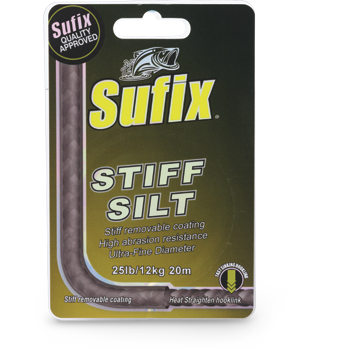 The Stiff Silt coating is thicker and stiffer, which when heated with either friction (from running your fingers up and down it) or by 'steaming' will retain its shape helping to 'kick out' heavier baits. The skin of Stiff Silt has a dull black, green or brown finish with matching core.